In the spring of 2014, a most unusual book hit the bestseller lists. With its multitude of equations, references to the Belle Epoque and Ancien Regime, and a title that harks back to Karl Marx and the politics of the late 19th and early 20th centuries, Thomas Piketty's Capital in the Twenty-First Century seemed an unlikely candidate for popular reading. However, the Frenchman's 700-page tome hit on an exposed nerve—the increasing disquiet that Americans feel toward the gap—really a chasm—between the poor and the super-rich. In addition, he surmises the US public has developed a sense that maintaining a footing in the middle class is becoming exceedingly difficult. One of the few white horses in this dark scenario is the potential to harness the ability of community colleges to engage the less skilled in programs that can help many students, both young and old. By catering to new students and those seeking a career change or retraining, community colleges help make middle-class dreams come true. In the 2015 State of the Union address, President Obama noted the importance of community colleges, saying they "should be as free and universal in America as high school." The President's plan, which is modeled on Tennessee's program that guarantees two years of community college, would provide, according to a PBS article, "tuition-free classes for students going to school at least half-time who maintain a GPA of 2.5 or higher and are making steady progress toward a degree or transferring to a four-year institution." New Mexico business leaders, particularly those in health care, discovered a large education gap for entry-level workers. 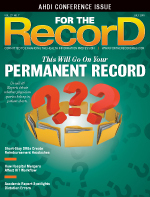 This caused headaches when these staff members encountered the complexities of working with EHRs. With narrow profit margins the norm in today's health care environment, organizations prefer new hires to hit the ground running without investing in on-site training. On top of this challenge, New Mexico has an unusually high number of baby boomers, which has resulted in a depleted health care workforce, especially in the public health sector where nurses and HIM professionals are difficult to come by due to dwindling numbers and a lack of competitive wages. In response to the demand for more skilled health care professionals, partners in New Mexico's Skill UP Network: Pathways Acceleration in Technology and Healthcare (SUN PATH) defined, enhanced, and clarified study programs in allied health, HIT, and emergency medical services. The programs allow for stacked and latticed credentials that build on entry-level credentials. The goal is for students to use this education as a springboard to obtaining certification, degrees, and career advancement (see figure). 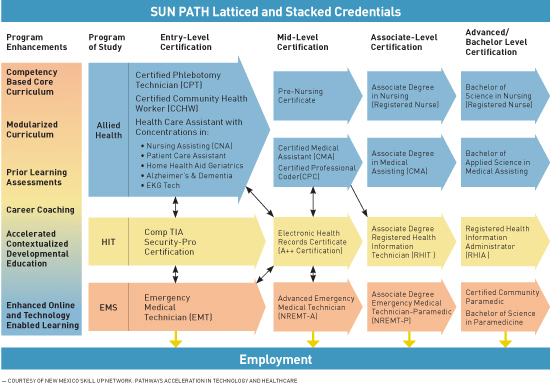 To meet New Mexico's anticipated employment needs, SUN PATH colleges are expanding certificate and associate degree programs by aligning course and curriculum sequencing, the SUN online course sharing network implemented through the Skill UP Network (SUN), and medical simulations. New Mexico's Department of Workforce Solutions benefited from the ARRA, which in 2009 amended the Trade Act of 1974, enabling grants through the Trade Adjustment Assistance Community College Career Training. The SUN PATH partners took advantage of the opportunity, eventually earning a $15 million grant to develop new career paths. While Santa Fe Community College serves as the lead institution for the consortium of state colleges, Central New Mexico Community College in Albuquerque received a large portion of the funds and the lion's share of the responsibility for HIT program development, which is headed by program director Teerinthorn Watchman, MA, RHIT, CCS. Overall, 11 community colleges are involved in the education effort, with three institutions featuring accredited HIM programs. The Department of Workforce Solutions is tasked with tracking the students' search for employment following graduation. The department relies on data to determine the program's effectiveness, paying particular attention to how it's improving the talent of New Mexico's workforce and graduates' employability. The program's three primary targets are veterans, low-skilled workers, and displaced workers. The grant focuses on defined pathways that lead to concrete jobs. A common core of classes in the HIT programs exists throughout the state, which has eased the development of the EHR certificate classes. Central New Mexico Community College (Albuquerque) has completed the majority of the curricula for the HIT and emergency medical services (EMS) certificate programs. The duration of the grant is four years: three in active development and the final year to accomplish a reporting process. Within that timeframe, 798 students must have seen services from the grant whether it involves equipment, career coaching, enhanced course materials, or other criteria. A significant portion of the program involves engaging students from the moment they enter the certificate programs. One requirement of the grant is that students must work with a career coach, who is available through the community college. These students may be already engaged in the EMS, nursing assistant, HIT, EHR certificate, or a developing health informatics program. One particular challenge in New Mexico, a vast and scantily populated state, is connecting with rural residents. Watchman notes that both patients and students are scattered, making it imperative that access to education and EHR technology be available regardless of location. It's important that students emerge from an EHR program not only trained in health care's technical aspects but also culturally competent enough to relate to New Mexico's numerous Native American tribes, a predominant Hispanic population, an emerging Asian community, and multiple transplants from across the country. In a bid to be more diverse, many EHR vendors are in the process of figuring out how the technology can be tweaked to better care for patients across cultures. Another hurdle is finding qualified educators. Existing HIT instructors may be able to teach the classes, but as the EHR certificate program and technologies evolve, they may need to either renew their skills through field experience or return to school to update their education. The ever-evolving nature of health care also plays a factor. It's hard to know "what kind of new professionals the health care industry will need," says Tamra Mason, MD, dean of the health, wellness, and public safety programs at Central New Mexico Community College. "How do our programs lead the student/job seekers there?" The creation of supervised internships that go beyond inpatient settings may be a step in the right direction. These internships can help students identify employment opportunities and provide a better idea of where their skill sets and training fit best. The US Department of Labor's Office of Apprenticeship has created communities of practice to provide graduates of the EHR certificate program with professional contacts who can answer questions and provide resources. The office also promotes "externships" for high school instructors to help them generate student interest in EHRs. This fits well with Central New Mexico Community College's extension program that provides credits for high school students ready to take classes at a community college level. Students are introduced to career possibilities prior to graduation in hopes it may help New Mexico solve its shortage of skilled health care professionals.